The film is simple enough in narrative with a sickeningly adorable conceit: a baby bird just wanting to be fed. The animation in Piper is phenomenally textured. Grains of sand pop out into the forefront to the point where they could steal the focal point away from the bird subjects. POV shots of waves crashing toward the camera look striking. The birds themselves, while not being as photo-real as the landscapes, are animated with a personality that is essential to the short’s success. 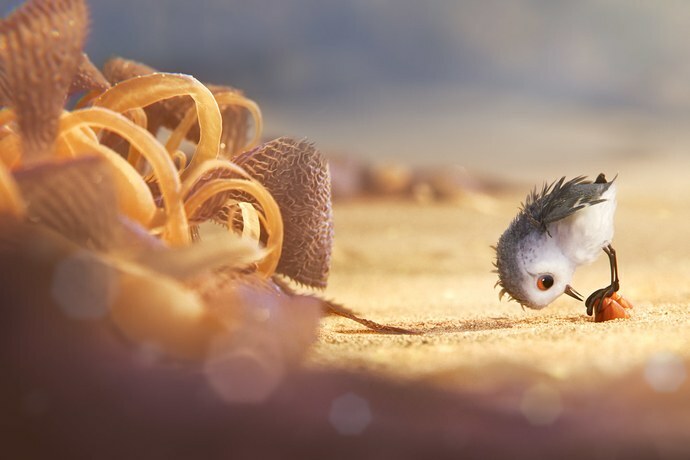 Although I don’t gravitate toward the adorable for adorable’s sake, this short uses grade A+ animation to bolster a sweet and simple narrative framework that places the cutest animated baby bird among all other cute animated baby birds at the fore. The animation is gorgeous; vibrant and bright. Piper may be the best Pixar animated short of the lot of them. I will say that, having seen no other contenders to this point, Piper has easily moved into the frontrunner position for the 2017 Oscar for Best Animated Short Film. It will be a tough beast to knock down come next Winter.